Bagel making seemed daunting to me at first, but it is simpler than I imagined. I dedicated half my Saturday to the project and got into the groove. A two step process of boiling and then baking is very similar to pretzel making. From time to time, I burst into self satisfied high pitched giggles or witchy shrieks as they must have sounded like to my guys here. The touch and feel of the dough in its different stages was sensational. I was happy doing my own thing. Hypnotized. Entranced. The crust was perfectly chewy, as it should be, just like in a traditional bagel. I should have picked up that the crumb wouldn't be as dense as in a traditional bagel, when I saw baking powder as one of the ingredients. The baking powder gives the crumb a feathery crumb, similar to chiffon cake, even though we have yeast in this dough as well. I just found it curious to use both yeast and baking powder in the same recipe, so I plunged ahead with it. Regardless, the bagels were gorgeous and delicious. Besides, this is my first in the bagel series and once we run out of this batch I am going to try another recipe, or take this one, omit the baking powder, use less yeast and maybe make a sponge or shorten proofing time and see what happens. 1. Use bread flour, it's higher in protein and helps develop gluten for a chewier texture. 2. Once bagel is formed, let it rest for a couple of minutes covered with a kitchen towel so it will immediately float when boiling. It must rest for a few minutes, otherwise even with simmering or boiling water it might sink and get stuck to the bottom. This is not a second proofing. The bagels do not need a second proofing, just a quick rest. 3. When you scoop the bagels, after boiling for a minute on each side, with a flat slotted heat resistant spatula, let it dry for a few minutes laid on a cookie tray. Pick up gently and flip into a parchment lined cookie sheet. Immediately add the topping, be it sesame seeds, poppy...while the flipped side is still wet. Let it dry for a couple of minutes longer after adding the toppings and then proceed to bake in a 410F pre-heated oven. This step makes sure the bagels do not come out gummy and pasty. 4. Ideally add 1 tablespoon of malt syrup to the boiling water, but I didn't have any, so I added molasses. The recipe called for Silan - a date syrup. The water will be murky but no worries. 5. Thanks to Jennie Schacht, I added 1 teaspoon baking soda to the boiling water which in my opinion contributed to perfect the crust of the bagel. Apparently this step is done to achieve a browner crust when baking. 6. Boil each side for 2 minutes for chewier bagels. I liked the crust perfectly boiled at 1 minute each side. 7. You can find an explanation why we boil bagels here. 8. I used a couple of techniques to roll the bagels but ended using as illustrated in this video which I liked best and will use again in future bagel making. 9. See #3. I didn't use egg wash before adding toppings. The dough is wet enough and the toppings stay on. I also don't like how an egg wash looks once the bagel is baked. 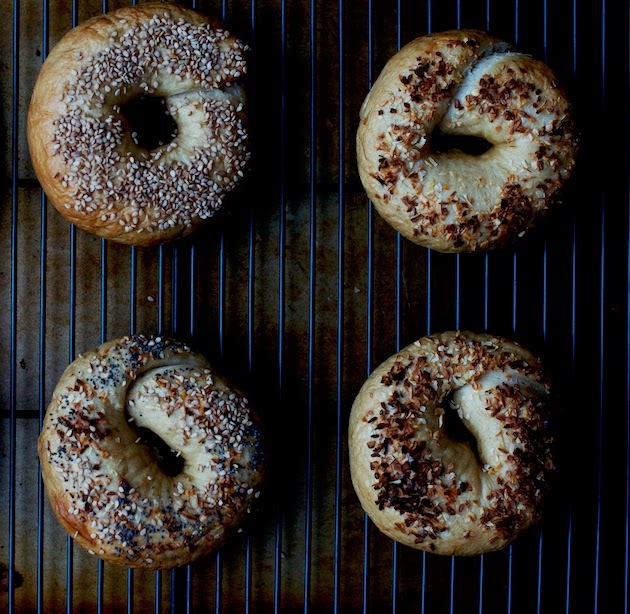 In addition, these bagels will be egg-free for those of you who do not consume or are allergic to eggs. 10. I didn't wish to make a separate cinnamon raisin batch, so I just sprinkled some cinnamon once I flattened the ball of dough to a round disc, added the raisins, then proceeded to roll and shape the rope and bagel. See video link above #8. 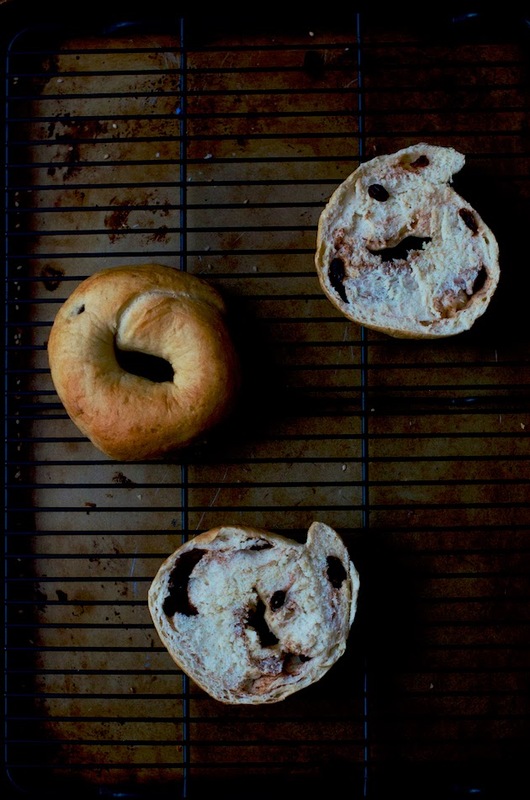 The cinnamon raisin bagels were my favorite. 11. I found I like to boil the bagels best on highest heat setting, on boil, not simmer. Keep in mind stoves vary and you should adjust accordingly. I had a large deep and wide pot which is another factor to consider. If affect how fast and the rate of the water boiling. There is so much more to share and I will probably have more findings as I bake more bagel batches but these points above are a good beginning. If you have any tips, suggestion or recipes please share in the comment section below. This batch made a few of each: sesame, poppy, minced onion, everything (sesame, poppy and minced onions) and cinnamon raisin bagels. Add the yeast, sugar and water, mix and let sit for a few minutes. Add the flour, salt and baking powder into a mixer bowl with a dough hook attachment and mix on low. Add the yeast mixture and oil into the flour and knead on low setting for approximately 8 minutes. Coat the dough lightly with some oil and set in a ceramic or heat resistant glass bowl, covered with saran wrap, in a warm space to proof for 45 minutes. Bring the water to a boil and add the molasses and baking soda once the water comes to a boil. Mix and reduce to a simmer until the bagels are ready to be boiled. Form 16 equal balls of dough and keep covered with a kitchen towel. Shape each ball as shown in this video. 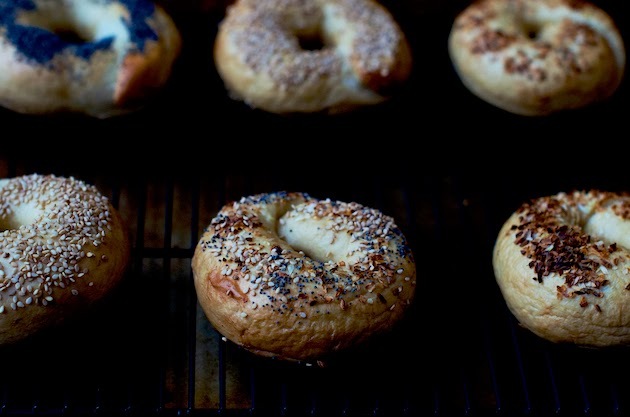 Let the shaped bagels rest for a few minutes covered with a kitchen towel. Bring the water back to boil and drop the bagels in a few batches. They will immediately flow to the top. Boil for 1 minute on each side. Scoop with a heat resistant slotted flat spatula into a cookie sheet. Let tops air dry for a few minutes. Pick up gently and flip into a parchment paper lined cookie sheet. Immediately add desired topping (sesame, poppy, minced onion or all three for everything bagel) and press lightly with your fingers. Make sure not to indent the top of the bagels when pressing. Let the flipped side with the toppings on air dry for a few minutes before baking for 15-17 minutes or until golden on top. Add a couple of sprinkles of cinnamon and desired number of raisins when flatting each dough to a disc shape, roll and create the rope for the bagel. See video as a reminder. Freezes well individually foiled and covered with saran wrap. Re-heat in a 350F pre-heated over for 10 minutes foiled and frozen. Serve with egg salad, smoked salmon and/or cream cheese. I'm so glad I've delayed trying bagels--they've been at the top of my list for so long but I've been afraid. I will refer to this post when I do finally give them go. 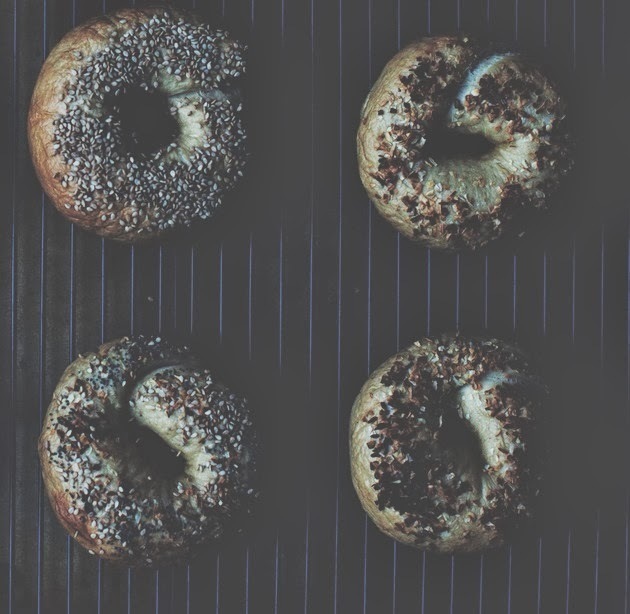 Your bagels turned out beautifully! Thanks so much for your tips, Shulie. Happy New Year! TY Jean. Let me know when you make bagels. Happy New Year to you as well. TY Rosa. Happy New Year. The funny thing is I've made bialys several times, but never bagels. They also get denser and taste more like you buy in a deli after a day or so. We can't get those here, so that is why I make bialys. Manservant was asking for some the other day, so maybe I'll get around to posting them. He always eats them before I get a chance! What a great post! TY Abbe. Never made Bialys. :) I've got to look but just different shape, no? I would love to make my own bagels. These look wonderful, and such a great weekend project! אני לא מתלהבת מהמתכונים של "על השולחן" אבל הבייגלה שלך נראים פשוט אליפות!! lol I can imagine how focused and happy you must have been making those perfect bagels. I have to say I have never used baking powder and yeast together in one dish but I remember my teacher mentioning it. hmm I am not sure what I could use here in India as bread flour, we only have one white plain flour type which they call Maida. I suppose that will have to do. Thanks for sharing Shulie and Happy New Year! Oh, bagel making at home is so rewarding! I love how they transform from wrinkled-just-boiled ugly things to plump golden bagels. A wonderful post, both the pics and the instructions Shulie! 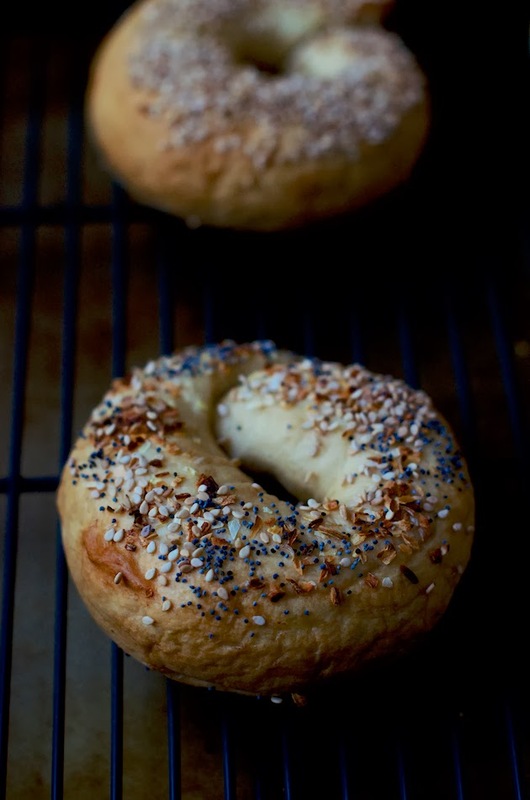 I love to bake bagels...it doesn't compare to those found already baked (unless at an incredible deli in NYC!). I'd take one each from your collection here! Happy New Year, Shulie!! TY Lora. I wish I could share...I bet yours are just as delicious. I am curious which recipe do you use? These are really gorgeous. I love the lighting! Now I just need the lox and schmear. I just started baking with yeast last year. Bagels are still on my "must" try list of yeasty products to bake. I love all of your tips--can't wait to give them a try this year! Those look like something you'd get out of a high end bakery. They're beautiful! I have some bread flour at home and now I have the urge to get into the kitchen and try these! That might be the most perfect bagel I've ever seen. Gorgeous. Bagels are the best!! I haven't made homemade ones in far too long! Beautiful bagels! I've wanted to make my own for a long time and you are inspiring me to do so right now! Oh my goodness, these look perfect! And now I REALLY want a cinnamon bagel to go with my morning coffee. I'm so glad the baking soda tip worked for you! Your bagels are gorgeous, Shulie. Enjoy them!